Imaging techniques that use light microscopes (microscopy) to visualize the dynamically complex systems and structures of living cells are vital to helping researchers understand cancer and other diseases. However, the best conventional imaging methods only render images at a resolution of around 200 nanometers. 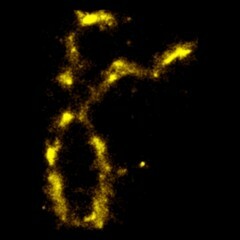 Using a super-resolution technique called DNA-PLM (single-molecule photo localization microscopy), researchers imaged a single human chromosome at the 20 nanometer scale. DNA-PLM does not require researchers to tag the sample with fluorescent labels that may otherwise interfere with the cellular processes under study.